Transit Standards is a collection of tools, resources, and examples to streamline the public transit customer experience, compiled by Stewart Mader. It contains over 30 brand and graphic standards systems from transit agencies around the world, as well as dozens of articles, examples, and case studies on branding & identity, customer experience & wayfinding, and digital & social media. Submissions welcome! 77 Ways to Design the Letter ‘M’ – Eric Jaffe, CityLab, on how mass transit agencies around the world make the letter M distinctive, memorable, and recognizable in logos used throughout their cities. A Sign Systems Manual – Alan Fletcher Archive, on Crosby/Fletcher/Forbes design system for the ocean liner QE2. 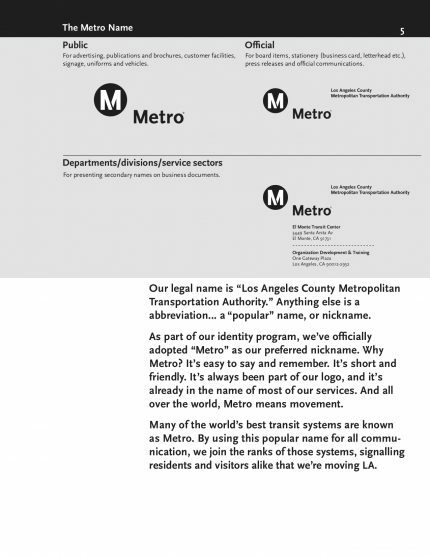 Branding the Metro – Katie Conway, Siegel + Gale, on using brand architecture, visual identity, and brand experience to create a unified transit experience in Los Angeles. 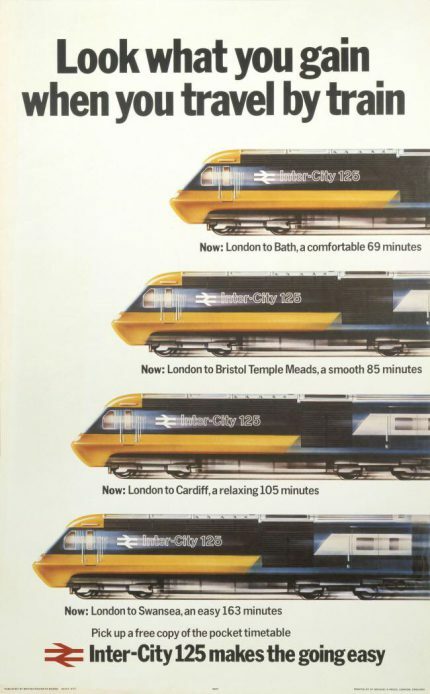 Design for Rail – Design Museum, exhibition and catalog on the design system for Britain’s Railfreight. National advertising effort needed by local transit agencies – Ethan Goffman, MobilityLab, suggests that transit agencies might benefit from pooling some resources to mount a national advertising campaign focused on the benefits of swapping the car for the train, or bus. Pick, Johnston & Kono: History of the London Underground Typeface – The story of the London Underground typeface is important to urban history because it set the standard for identity and communication in railway systems around the world. It starts with Frank Pick, publicity manager for the London Underground. Prince George’s “TheBus” needs better branding and communication – DW Rowlands & Tracy Hadden Loh, Greater Greater Washington, critique issues with a Maryland country’s transit system’s branding, communication, and website that contribute to poor knowledge of the system, and low ridership. Return of the Standards Manuals or Revenge of the Rigid – Sean Adams, Design Observer, on the resurgence of interest in graphic standards manuals in the digital age. Smart Branding Attracts the Masses to Mass Transit – Josh Stevens, InTransition Magazine, highlights messaging and campaigns that get people to change their minds about taking transit. Transit Branding’s Virtuous Cycle – Josh Stevens, InTransition Magazine, writes that effective branding and messaging can help get the public to take notice of other improvements being made by transit agencies. Are Our Transit Maps Tricking Us? – Jessica Gross, CityLab, explores the impact of transit map design on the ways people move throughout cities. European Bus Maps : the State of the Art – Jug Cerovic, on techniques used in European bus maps to represent service types, lines, and frequency. Flying Colours – Austria’s ÖBB national railway and Wiener Linien collaborate to incorporate ÖBB’s S-Bahn lines in specially marked in green and vintage pink on all transit maps, including the rapid connection map, the “overhead map” on underground doors and the Vienna metropolitan area public transit map. Fonts in Use: Transportation – Excellent directory of fonts used in various transportation applications, from a longstanding and well-regarded archive of typography. How to Design a City for Women – Claire Foran, CityLab, on Vienna’s work to apply its gender mainstreaming strategy to pedestrian mobility and public transit. Improving the Customer Experience – White Paper, Transit Leadership Summit, on the ways addressing customer experience can make transit more attractive to riders. Inscribed in the Living Tile: Type in the Toronto Subway – Joe Clark, Association Typographique Internationale 2007 Conference, on the evolution of typography in the Toronto Subway. Mind the Map! The Impact of Transit Maps on Path Choice in Public Transit – Zhan Guo, Rudin Center for Transportation Policy & Management, investigates the role transit maps play in passengers’ travel decisions. Mod Desire – Onastasia Yousef, Pittsburgh City Paper, on Pittsburgh’s trolley disguised as public art, designed by Diana Riddle of Pittsburgh-based Peter Muller-Munk Associates (MMA). MMA also designed the NJ Transit graphic standards system and manual in 1981. Moscow Metro map 3.0 | 2.0 | 1.0 – Detailed case studies from Art Lebedev Studio on the studio’s process for designing the official Moscow Metro map, individual line maps for cars, and station map with information about local sights and parks. Munich Transport Corporation: FAQ – MVG, the Munich Transport Corporation, answers questions like, “Can a major metropolis function without public transport?”, “Why don’t underground trains operate throughout the night?”, “Why are there no longer any carriages in the new underground?”, and “How come the buses are so punctual?” The agency deliberately chose questions that allow it to promote its work running public transit in Germany’s third-largest city, but the document is a compelling example of how a transit agency can guide the narrative in explaining topics like priority signaling to keep buses moving in traffic, the increased passenger capacity of open-gangway subway trains, and maintenance necessary to keep the city’s transit fleet running. New York & New Jersey Subway Map – New York Subway Map with New Jersey transit systems, including Hudson-Bergen Light Rail, NY Waterway ferry, & PATH. Built by Stewart Mader to improve transit wayfinding in the largest US metro region. Play Everywhere Playbook: Transit – Kaboom, on incorporating opportunities for play into public transit, to enliven transit trips with children. Remembering the Designer Who Changed the Way We Think About Transit Maps – Mark Byrnes, CityLab, remembers Massimo Vignelli’s impact on American graphic design. Rome’s Metro Map displays the platform configuration of stations, so riders know on which side of the train the doors will open. Seamless Transit – SPUR proposes five strategies for integrating public transit throughout the San Francisco Bay Area. The Undervalued Simplicity of Bob Noorda’s Vision for Milan’s Metro – Mark Byrnes, CityLab, on Dutch-born designer Robert Noorda’s wayfinding system for the Milan Metro, which he designed before collaborating with Massimo Vignelli on the new York City Transit Authority Graphic Standards Manual. Toronto Transit Commission Signage Evaluation – Joe Clark & Stephen van Egmund, Two Planet Consulting, assessed the real-world performance of signage when using TTC subway stations. Transit Maps: Apple vs. Google vs. Us & A Technical Follow-Up: How We Built the World’s Prettiest Auto-Generated Transit Maps – Anton Dubrau, Transit App, explains why-and how-the app maker built its own custom transit maps. Transportation Communications Newsletter – Daily collection of transit-related news, published since 1998 by Bernie Wagenblast. Travel Support Card – Transport for London offers a Travel Support Card for anyone who finds traveling difficult. The card provides space for a customer’s name, emergency contact info, and anything that can help staff provide support during a journey. Typography on the Subway: A Trip Around the World – Ricardo Magalhães, Prototypr, on the typography choices used by subway and metro systems around the world. Wayfinding With Lance Wyman – Mark Byrnes, CityLab, on graphic designer Lance Wyman’s impact on wayfinding, from his iconic symbol systems for the 1968 Mexico City Olympics and Mexico City Metro, to the unused symbol system he created for the Washington, DC Metro. 9 Basic Principles of Responsive Web Design – Sandijs Ruluks, Froont, explains the fundamental principles of building a website that gracefully scales to any screen size. Not transit-specific, but an essential resource for anyone building a transit website. Digital Transformation at SBB – Swiss Federal Railways digital transformation strategy and accomplishments in three areas: improving interaction with customers, increasing internal efficiency, and capacity management. Frequency and Real-Time Info Help Transit Riders Most – Matt Caywood writes for Greater Greater Washington that real-time and frequency info via apps and station digital signage are two things agencies can do to can help riders at a much lower cost than building new transit service. How BART used social media to turn crisis into opportunity (and how WMATA didn’t) – Andy Furillo, MobilityLab, on the successful crisis communications approach taken by Bay Area Rapid Transit (BART) to educate riders during a service disruption on the system’s inadequate funding, and rally support for new funding from the California legislature. In Crisis, Public Officials Embrace Social Media – Brian Stelter & Jennifer Preston, New York Times, write about how Hurricane Sandy prompted public officials to use social media to engage with the public, find out where assistance was needed, and share updates on recovery and restoration. In the Planning Process, Social Media Talk is Often Cheap – William Herbig, Greater Greater Washington, makes the case that public agencies will get feedback more fully representative of community needs when they formally accept public input via social media. LA Metro’s Maintenance Diaries – On its blog, The Source, LA Metro runs a series called Maintenance Diaries, to profile work done to keep the system in a state of good repair. Topics include: How Metro trains are powered, How bus service is restored after a breakdown, What makes a train run smoothly, and The New Blue Line. Mastering Digital Project Momentum – Perry Hewitt writes for A List Apart on where large-scale digital projects can stumble, and how to keep them on track. Not transit-specific, but timelessly useful. Roles & Responsibilities – Room 34 Creative Services provides a helpful guide to the typical roles and responsibilities on a professional digital team. Not transit-specific, but helpful for ensuring you have the right team in place to build your transit digital experience. Subway Weekender – A Guide to Weekend Service Changes in the NYC Subway. Unofficial, but essential for its simple format that shows, at-a-glance, how lines are affected by essential weekend construction. Tardy Transit? Tweet About It – Tod Newcombe, Governing, looks at how transit agencies are using social media to engage with customers, gather feedback, and make changes and improvements based on customer input. The Web is a Customer Service Medium – Paul Ford, PostLight, makes the case that the Web is best used as a customer service medium, instead of a publishing medium. Not transit-specific, but essential for understanding how the Web can be used to enhance transit customer experience. Welcome to the new transitchicago.com – Chicago Transit Authority built a page to accompany the release of its completely refreshed website. The page explains the overhaul, with sections titled, “What’s New?, What’s Not?, and What’s Next?”, a selection of “Pages we think you should check out”, fun facts and stats on the website, and a visual history showing the evolution of the website from 1996 to the present. Welcome to this new website – Montréal STM built a page to introduce customers to its new website, with video explainers for new real-time bus location and schedule info, FAQ, and a place to share feedback. BART takes customers behind the scenes with a visual of maintenance work, as well as a plug for employment opportunities. BART engages customers in decision-making about what information to provide in platform-level display cases. BART includes maps showing alternate service options near BART stations during a service outage caused by a track fire. CTA provides specific guidance on a nearby alternate bus route while service on the L Pink Line is disrupted by a mechanical problem. Loop-bound Pink Line trains are standing at Western due to a mechanical problem on a train; Consider using 21 Cermak bus as alternative. CTA’s #YourNewBlue Program, will promoted by Chicago Mayor Rahm Emanuel, encompasses track and station upgrade along the L Blue Line between Grand and O’Hare stations to improve customer experience and reduce travel time. 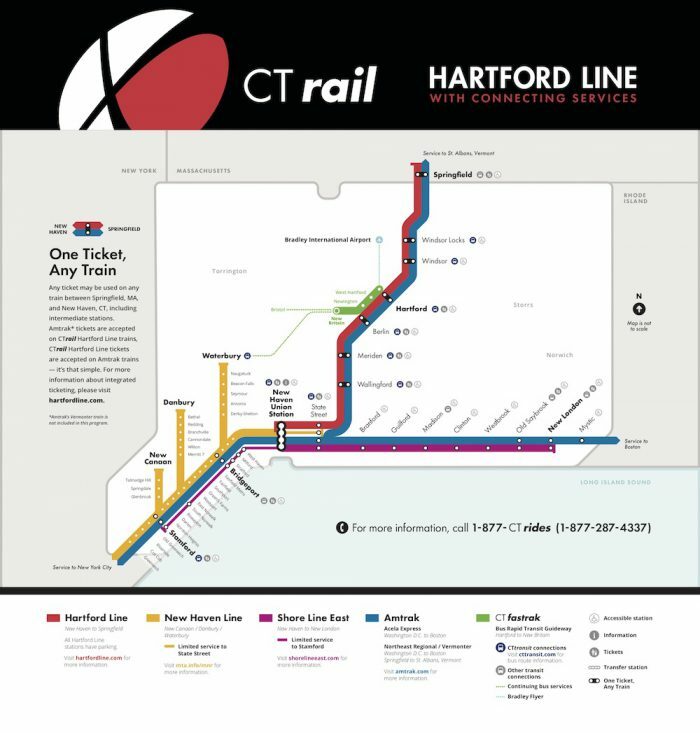 Hartford Line – Map depicting service on a new rail line connecting New Haven, CT, Hartford, CT, and Springfield, MA shows how Connecticut is developing a transit ‘spine’ through the center of the state. Bus rapid transit is included as well, and the “one ticket, any train” policy and messaging is an excellent way to ensure a smooth customer experience. LA Metro collaborates with Los Angeles Football Club and professional soccer player Latif Blessing to produce an ad showing fans how to trade the car for the train to get to the team’s matches. LA Metro encourages its riders who use social media to share its updates with timely information on alternate options during service disruptions. LA Metro Bike Share uses social media to attract riders with a $2 Tuesdays promotion. MetroTransit gives Minneapolis transit riders clear, useable information on where to board eastbound Green Line trains during a service change caused by a vehicle blocking tracks. Due to a semi blocking tracks, board eastbound Green Line trains on the westbound tracks at these stations: Prospect Park, Westgate, Raymond. Midttrafik, a Danish bus company, borrows from movie trailers to promote its bus services with The Bus, and The Bus: The Sequel. New York City Subway shares information on planned service changes via social media using a visual layout that matches the design and information architecture of posters displayed in stations. New York City Subway uses photos to show customers what was accomplished during weekend work on subway lines. PATH reminds riders about its alternate service guide, which highlights alternative options riders can use if service is disrupted on the subway connecting New York & New Jersey. PATH uses photos to show construction progress on new tracks and platforms at the World Trade Center station. RTD invites Denver-region residents to participate in a telephone town hall to learn about operations, get project status updates, and ask questions of the agency’s board of directors. Seattle’s Sound Transit reminds customers to remove backpacks with a message from the backpack’s perspective that avoids coming across with an admonishing tone. TTC uses simple, customer-friendly language to help riders use alternate transit options during a service disruption. TfL uses icons to ensure messages reach non-native English speakers. ♿⛔ Bond Street Station: No step free access due to lift maintenance. ♿✅Bond Street Station: Step free access restored to the platforms. TfL uses a night-sky themed campaign to advertise new night service on the London Overground. Where will the London Overground Night Service take you next? TfL previews The New Tube for London, the next-generation train that will run on the Piccadilly, Bakerloo, Central, and Waterloo & City lines, with an ad that shows the train in action. TfL promotes access for all by sharing its work with the Alzheimer’s Society to educate employees about how to recognize and assist customers who may be suffering from dementia. TfL’s Every Journey Matters campaign outlines the agency’s investments in infrastructure, technology, and vehicles to improve access, provide reliable service, and put the customer first. Västtrafik, a Swedish transit provider, appeals to people with ads that apply some of the best themes of car commercials to transit: tight shots of a fast drive through stunning natural scenery, closeups of aerodynamic curves, and the allure of a test drive.